I recently picked up a bottle of China Glaze Flip Flop Fantasy in a sale at my local Sally's, after hearing so many good things about it. It makes my hands look super tan, which could be a good or a bad thing...? I kind of did whatever I felt like with these, neons seem to be perfect with crazy designs! 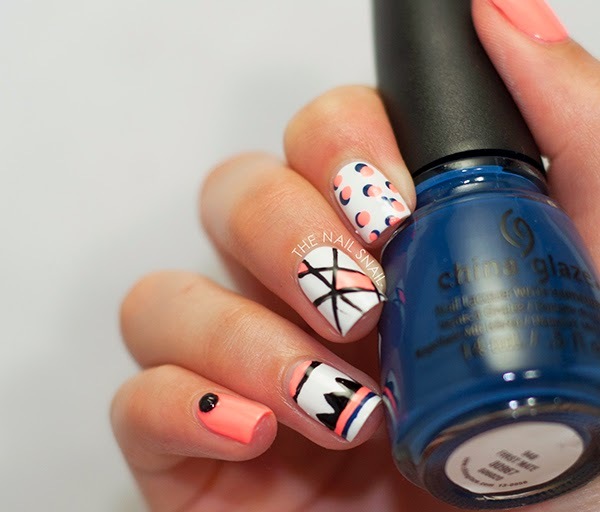 I tried to add some navy blue to the tribal with China Glaze First Mate, but it pretty much blends in with the black. Thank youuu!! Yay, I'm glad somebody noticed :) too bad it's not more visible in person! your mix manicures are always amazing! Yep -- for me a pretty polish is worth having to deal with a bad formula! I did hold out for awhile but the BOGO sale at Sally's got me :) Thank you! !